Beginning this summer we have been working with global technology company RICOH to produce a series of testimonial videos for their production print solutions — apparently with very promising immediate results. To fulfill the job requirements, we have been going to print shops that use RICOH production print systems to videotape owners’ feedback about the product. Says the owner of a PIP Printing shop in northern New Jersey on camera: “When we tested the RICOH product, we brought some of our most complicated jobs. We were very, very pleasantly surprised that we got a lot more than we had anticipated with some of the extra features where we’ve been really able to put a lot more work, both black and white and color, than we ever have before because it’s just a much, much better product than we’ve had here in the past. If these quotes stand out in written form, multiply that impression by many-fold when they appear in video. It is only common sense: seeing and listening to the sincerity and feeling behind impactful words spoken by an actual shop owner who was not obliged to make the comments goes a long way toward effectively making a sale or closing a deal. Of course, this approach is not mutually exclusive of producing a more formal video ad for TV or online avenues using a script, actors and the type of sizable crew that such an effort requires. But in comparison to this more traditional commercial production, the budget entailed for short testimonial videos pales, and its results offer the promise of a resounding success. The opportunity to produce a video profile of a company in a portfolio of our global private equity client The Riverside Company often takes Curt (director of photography) and I (producer) on interesting adventures. 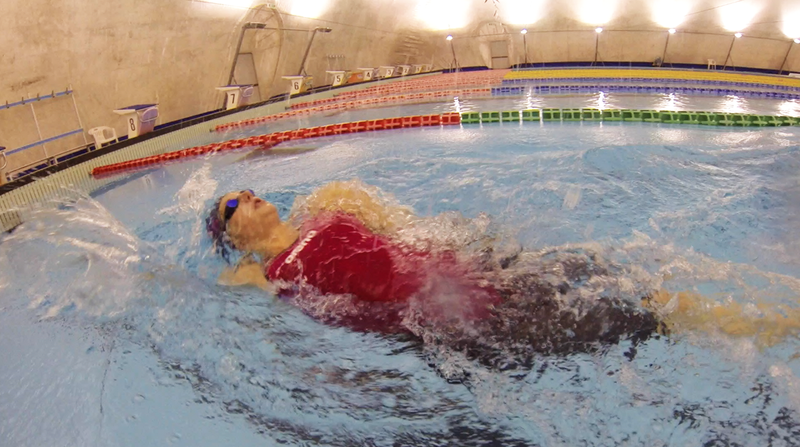 Two weeks ago, for instance, we had the opportunity to spend a day in Verona, Italy filming Olympics and World Championship swimmers who endorse the racing swimwear of the brand Arena, a company in Riverside’s European fund. As I watched Ruta Meilutyte (Lithuania, 16 years old) and Daniel Gyurta (Hungary, 24) fly through the lanes of the Olympics-sized pool while testing out the latest carbon technology that has been incorporated into their suits, I imagined them standing on a podium, gold medal in hand, filled with emotions as the national anthems of their home countries blasted into the ears of the world after their wins. They and their World Championship gold medal colleague Katinka Hosszu (Hungary, 24), who was also present in Verona, are international stars, revered by swimmers, athletes, and ordinary people who delight in the extraordinary talents of superpeople. During international events like the Olympics or the World Championships, they live in a bubble of fame surrounded by countless other swimmers and coaches, reporters and fans. But on the day we videotaped, there was almost no one around but the folks from Arena and us, and we were treated to a slice of time with these wonders of the world. Curt was excited to use a GoPro to capture them from the underwater perspective. Attaching the camera to the end of a long stick, he walked down the perimeter of the pool holding one end, ensuring that the camera at the other end stayed beneath the swimmers’ bellies as they glided effortlessly through the pool lanes adjacent to him. His footage highlighted their perfect underwater moves — as well as the brand name of the company they endorse. Adding to the value of the video, we also spent time interviewing the Olympians, a formality that was preceded and followed by normal conversation. I was excited to learn that Katinka – and her coach/husband Shane Tusup – went to USC, my daughter’s alma mater. Most impressively, all three of the swimmers were very humble, friendly people simply doing what they love to do and fortunate to be so successful at it. We spent that day in the closed confines of an indoor pool facility which could have been located anywhere in the world, but when we finished recording the interviews and b-roll, we had two free days until the next planned day of shooting. We spent a sunny morning at the Adriatic Sea, and another day driving on little roads that traverse tiny towns with stone buildings that have been standing for centuries. In these non-tourist locations, I ate the freshest and most delicious Italian veggie food I’ve ever tried. A special treat was stopping for lunch one day to meet our friend Ruth Ellen Gruber, an award-winning writer and journalist who lives near Todi. She gifted us with a can of oil pressed from olives she had picked in her garden. I’m quite sure I will never be able to enjoy store-bought olive oil again. A couple of days later we were back under the Arena wing. Katinka stopped by the company’s headquarters in Tolentino to meet the staff and learn about new products. It was fun to see her surrounded by scores of staff asking for her autograph. She chatted with them, one at a time, writing personal messages on the postcards they handed her. We also enjoyed watching her delight in the panoply of Arena products that filled the company’s headquarters, examining the fabrics of swimsuits, trying on new goggles, and picking out her favorite sports bag. Very cool to have such incredibly talented and down-to-earth folks as brand champions for millions of people to emulate in countries around the globe. As for the video, we are having a very good time in the editing suite. 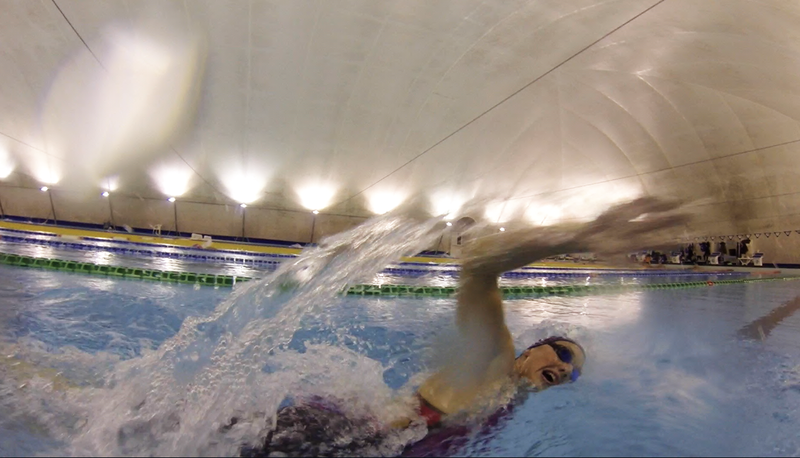 We get to ooh and aah over footage of perfect strokes of several of the world’s most talented swimmers. We even get to act as surrogate coaches in a way, choosing where to start and stop each beautiful shot. Editing this company profile (as all videos we produce), we are ever mindful of its ultimate audience – the Riverside investors and others interested in the firm’s portfolio of companies. I am certain they will be very pleased to be a part of such an exciting and successful venture. Aesolutions: Reading – maybe not AESOp’s Fables – but other great books that trigger the flow of creativity to many video projects. Besolutions: Finishing the documentary Flory’s Flame, about 90-year old Sephardic musician, composer and performer Flory Jagoda, whose compositions in Ladino – an ancient Castilian Spanish language — harken back to pre-Inquisition Spain. “BESO” in Spanish (“bezo” in Ladino) means “kiss” – many of which are crucial to happiness in the coming year. Cesolutions: While we don’t generally attend the Consumer Electronics Show (CES), Curt Fissel in our office annually goes to the gigantic National Association of Broadcasters Show (April 5-10, 2014 in Las Vegas) where all the latest and greatest technology in the video production and broadcasting industry will be introduced and exhibited. Desolutions: DESolate is what I plan NOT to be. Esolutions: Helping our clients be ahead of the curve with regard to video and all its new arms as the electronic highway continues to expand, and finding E-SOLUTIONS to interesting issues that arise. Fesolutions: FESsing up to gaps in my knowledge, filling them with deep dives into research, and supplementing weaknesses with the collaboration of colleagues strong in those arenas. Gesolutions: Learning rather than GuESssing. Hesolutions: As the female president of Voices & Visions, I’m all about “SHE –SOLUTIONS” (as compared to “HE-SOLUTIONS”), and I look forward to networking, brainstorming and collaborating with women executives. Iesolutions: Exploring substantive topics calling for video production in their depths, then reducing the understandings reached to simple messages – the onscreen equivalent of the textual use of I.E. Jesolutions: Like GESso used in artwork as a base before applying paint, continuing my commitment to thorough preparation before video shoots our company undertakes, which will ensure and preserve the quality of the final product. Kesolutions: An English variant of “BESOlutions” (see above). Lesolutions: Focusing on more solutions rather than LESs solutions. Mesolutions: Always aiming to MESmerize with video productions we create. Nesolutions: While the northeast (NE) is our home base, we now have an office in Dallas and we videotape on location internationally. Hoping to continue to expand our national and global work in the coming year. Oesolutions: The US Bureau of “Oceans, Environment and Science” (OES) advances foreign policy regarding climate change, renewable energy, resource scarcity, infectious diseases, and related fields. In 2013 we videotaped the ways in which the farmers of the Fair Trade, interfaith Delicious Peace coffee cooperative in Uganda are trying to overcome the impact of climate change on their crops. We will continue to pursue producing video clips about this issue and otherwise helping the farmers. Pesolutions: Had I been PESsimistic, I would never have taken the risk of running my own business. Optimism about everything – from small projects to the world economy – will dominate my thinking. Quesolutions: QUEStions are beautiful; they prompt intellectual and emotional growth. I am grateful that I get to interview and ask unlimited questions to so many interesting people around the world in connection with producing corporate videos and documentaries. Looking forward to new questions and answers in 2014. Resolutions: All of the above and below. Sesolutions: Who “SAYS SO”? Our clients say so. I will listen to their goals, concerns, interests, and parameters and help them build tailored solutions. Tesolutions: Marketing in 2014 will continue to TESt traditional vs. social media methodologies (including video) and with regard to the latter, how to measure ROI, the most effective combinations of approaches, and a host of other issues made possible by ever-expanding IT solutions. The question I will explore with clients is no longer whether to engage; rather, it is: What? Where? When? And how? Uesolutions: YOU are the e-solution! Our We will rely on our partnerships with our clients to ensure our brains and talents work together to produce the best solutions. Vesolutions: VES, Visual Effects Society, is an organization representing visual effects practitioners. From motion graphics in 2D and 3D to animations, audiences are growing accustomed to fabulous visual effects in videos. Looking forward to watching their growth in demand and providing clients with videos rich in a wide range of creative elements. Wesolutions: WESOłych Świąt: Polish for “Happy holidays!” Since we have produced five documentaries in Poland, the culture and language are close to my heart. Early indications are pointing toward an event on the calendar in Poland in 2014. Xesolutions: Having many opportunities to use XE, an online currency and foreign exchange tool, which helps calculate expenses when traveling to foreign countries. Italy, Spain, Bosnia, Croatia, France, Poland, and who-knows-where-else are on this year’s travel plans, so XE will come in handy. Zesolutions: Tackling challenges big and small with ZESt as well as love for the opportunity to tell stories through video. We are surrounded by music in our daily lives, but seldom are we transformed by its power. The perfect combination of pitch, melody, harmony, rhythm, instrumentation, and texture – collectively infused with an all-encompassing breath of soul – is a rare occurrence. Such truly beautiful music has unrivaled power that causes the heart to soar, the mind to refresh, and the spirit to awaken in love. It is ethereal, piercing, transformative, universal. Its presence emanates like rays of sun touching our essence. Getting swept up in one of these transcendent moments is a story worthwhile to share, and so I write today about the 90th birthday Celebration Concert of legendary musician Flory Jagoda that was held within the prestigious walls of the United States Library of Congress this past Saturday night. Long in the planning stage, the concert featured Flory and 25 others, including family members, colleagues, apprentices and students. Over decades of time, these associates have learned the songs that Flory has composed, taught and sung in her native Judeo-Spanish and Bosnian languages, all reflective of the Sephardic world of her childhood and of the generations that preceded her. A few days ago each of these very talented musicians honored their mentor by surrounding her on stage and chiming in with their voices and instruments –guitars, mandolins, violins, violas, cellos, bass, bongos, and bells –flawlessly weaving together melodies to which she gave life. The concert was presented under the auspices of the Homegrown Concert Series at the American Folklife Center of the Library of Congress. Flory has long been known as “keeper of the flame” for preserving, perpetuating, and expanding Sephardic Jewish cultural tradition through music. She was born in Sarajevo, Bosnia in 1923, and she was raised singing melodies taught to her by her Nona (grandmother) and other family members. A recipient of the rarely bestowed National Heritage Fellowship presented by the National Endowment for the Arts, Flory has also served as a Master Artist in the Folklife Apprenticeship Program for the Virginia Foundation for the Humanities (VfH). She has performed throughout the U.S. and internationally. Her solo voice, still miraculously close to perfection even at the age of 90, opened the sold-out auditorium housing almost 500 fans. She sang the second song with her granddaughter Ariel Lowell, a 21-year old musician who inherited Flory’s complex and beautiful musical voice and is currently recording her first album. Their duet was followed by a few selections by Flory, Ariel, and three of Flory’s children – Betty Murphy, Elliot Jagoda, and Lori Lowell, Ariel’s mom. Halfway through their second song together, the side curtains of the stage opened and Flory’s colleagues, apprentices and students joined the Jagoda family’s chorus. The songs that followed told stories that came from places and experiences that have defined Flory’s life. With a Jewish Sephardic family history that stretched back to Spain until the Inquisition at the end of the 15th century, then moved onto Turkey and spread out from there, Flory spent her early years living with her Nona, near her extended family in a small village in Bosnia called Vlasenica. She subsequently moved with her parents to Zagreb, Croatia. When World War II broke out and the Jews were forced to wear armbands with yellow stars, her parents sought refuge. They sent her ahead by herself to Split, Croatia, overcoming her 14-year old fears en route by playing her accordion in the train, which attracted the happy attention of other passengers and even ticket collectors. From Split the family escaped to the island of Korcula before ultimately arriving at a refugee camp in Bari, Italy, where she met the man who would become her husband – American soldier Harry Jagoda. After the war Flory learned that her entire extended family in Vlasenica, including her beloved Nona, had been murdered by the Ustase – the Croatian fascists who collaborated with the Nazis — and buried in a mass grave on the family property. Devastated, Flory knew that only she remained to continue the centuries-old family traditions expressed through their music. That cultural legacy is what the concert at the Library of Congress celebrated. Flory has succeeded in creating a litany of music that she has taught to and performed with extremely talented musicians over the past number of decades. 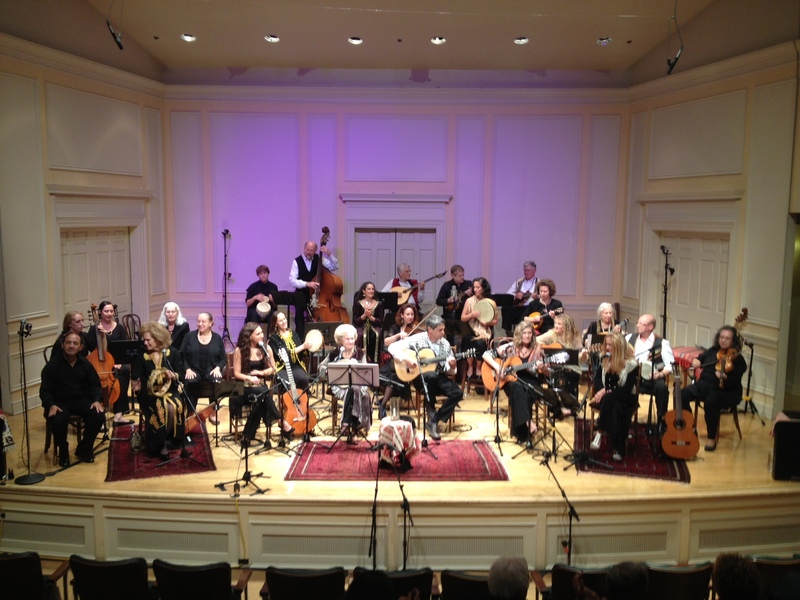 Among them – and joining her on Saturday in addition to her family members – were her guitar accompanist Howard Bass and original apprentice through a program of the VfH Susan Gaeta, now both well known independently for their prowess in the Sephardic musical world. Two cantors with voices that made the heart stop accompanied Flory: her longtime friend Ramon Tasat, president of Shalshelet: The Foundation for New Jewish Liturgical Music, and Aviva Chernick of Toronto, who frequently traverses the distance to Washington to be Flory’s current apprentice. And the magic that happens when Flory works with her two weekly students/colleagues Tiffani Ferrantelli and Zhenya Tochenaya was delightful to experience. Others who joined Flory on stage included Tina Chancey, David Shneyer, Betsy Cary, Alan Oresky, Larry Robinson, Theo Stone, Joel Leonard, Lynn Falk, Margie Jervis, Noah Taylor, Joanne Stefanick, Janet Dunkelberger, Heather Spence, Martha Halperin, and Cory Giacobbe. Amazing, that Flory Jagoda, which is why she is the subject of a documentary JEMGLO is producing called Flory’s Flame, featuring a number of songs from the Celebration Concert. Through the film many others will have the opportunity that hundreds of audience members experienced this past Saturday night of metaphorically flying to a warm and transcendent space in the universe. I don’t have favorites, never have. I’ve always found confusing questions like: “What is your favorite color?” — I like all the colors of the rainbow and the hues in between. Same thing when people ask me my favorite places to travel. My husband Curt Fissel — who is a director of photography and my business partner – and I (a producer/writer) are constantly on the global go for corporate video production and documentary shoots, but I don’t have a favorite destination. There are aspects of each place I appreciate, so I thought I would write some blogs from the road, elaborating on things that make me smile in different locales. Last week we were in Germany, videotaping for a private equity client that had just sold a company in its European portfolio and wanted us to produce a video highlighting the corporation and its impressive success over the holding period. When we finished all the field production relevant to producing a top line video, we took a few days to ourselves, visiting close friends who live in Bonn. 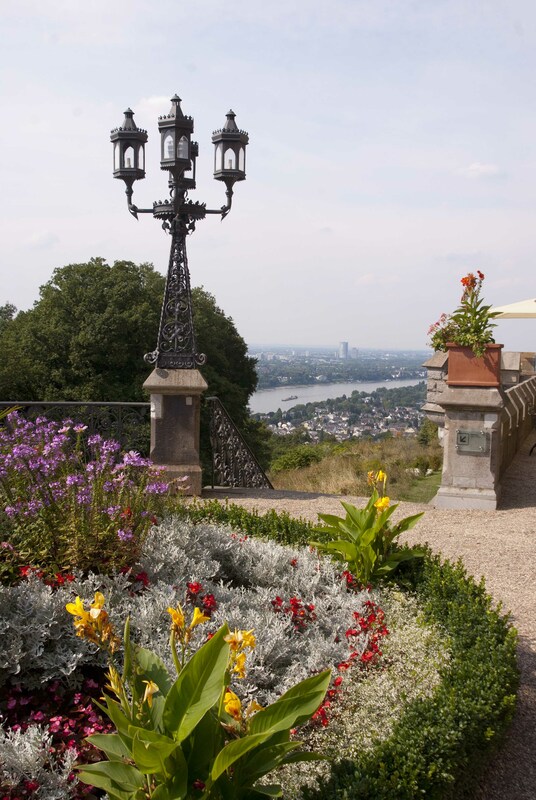 Yet that was not the weather that greeted us in Bonn last week, after the late spring climate had finally arrived on the cusp of July meeting August, and we had the chance to frolic in a few of the country’s attractions. One of my favorite activities in Bad Godesberg, the little hamlet where our friends live, is jogging on the pathway that contours the Rhine. Settled into rising hilltops along this segment of the majestic river are ruins of once-imposing castles. The age-old strongholds still convey a bygone aura of feudal importance, overlooking through cataract-type vision the goings-on of the world at their feet. Sightseeing cruises and cargo ships pass me as I run, reminders that the countryside’s natural counterparts (e.g., the river) run timelessly. Later in the day we all hop on board a train that also travels along the Rhine’s path. Whisking us south about 35 km., we get out in the village of Ahrweiler to partake in a winefest. Yes, you read it correctly: A winefest in Germany. Formerly not known as a serious competitor in the world of quality wine, this region has joined many others worldwide in improving its reputation, with impressive results. The vineyards in the Ahr Valley – known for its red wines — sit on 45 degree angles sloping up the sides of the Rhine. The fruits of the vines were exhibited in booths lining Ahrweiler’s main square, which framed the festival and the events taking place inside. An old-fashioned German brass band blared music to the much-anticipated annual election of a Wine Queen. A few speeches later, the coronation took place, after which the new queen was greeted by throngs of happy villagers holding bottles of locally grown Pinots and Rieslings. The year was 2013, of course, but it could have been 1913 or 1713. Unlike the physical castle structures along my morning jogging path, these old customs have survived in tact. Of course, even traditions are affected by change over time. Prior to World War II Ahrweiler had a small Jewish community. Apparently, the town was known as Nazi-resistant, but its Jews could not escape the Holocaust’s engine of death. No survivors ever returned to Ahrweiler. Significantly, however, the town has preserved the old synagogue, which is today used for cultural events. Curt and I, who have produced a number of documentaries on Jewish-related subjects, always visit these sites of former Jewish life in Europe. 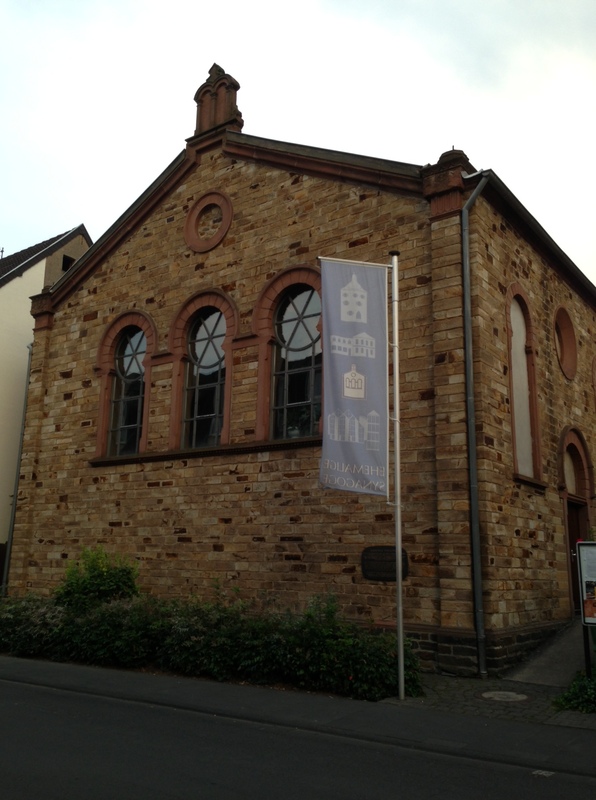 In Ahrweiler, our friends accompanied us to the former synagogue. We spent a few moments meditating in the atmosphere, listening to the voices in the wind and in our hearts, pledging anew to work to stamp out evil somehow, and experiencing gratitude for the energy of good people who remember, confront and commemorate. Back in Santa Monica, CA, I am working with some friends on an emerging project, www.EnjoyYourCoffee.net, which aims to be a travel website for coffee lovers around the world. Our Coffee Travel page lists good spots for coffee and conversation, beneficial for travelers to the region. Our group is trying to bolster the list of places worldwide, so wherever I travel, I try to visit the most popular cafes and add them to the list. 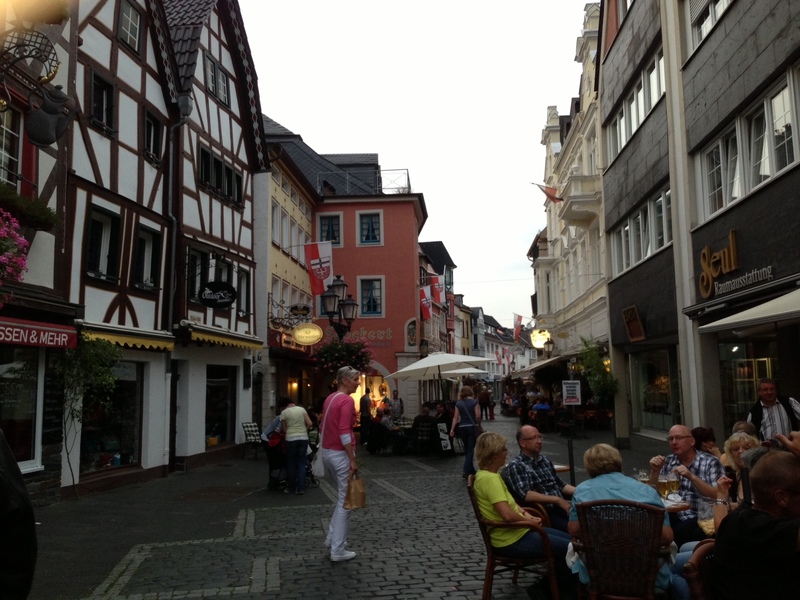 In Bad Godesberg, my friends’ son Lorenz brought me to Café Lindentraum. The cappuccino was high quality and the atmosphere was quaint, but the conversations at each of the small tables were quiet and private (i.e., not group conversational). That’s a reflection of the culture, Lorenz told me. The same was true when I jogged along the Rhine: In many places where I have been, joggers passing each other share waves and smiles. Sometimes there’s even a “hello” attached in one language or another. Not here. It would be unfair to call it UNfriendly; it’s just not the nature of the culture to open up to strangers. In contrast, at the dinner party our friends hosted one night, we enjoyed conversations that quickly dove into interesting analyses. I felt sad the morning of our departure. We had an amazing time with our friends. Their street fair was to happen that day, everyone on the block was cooking up something special to contribute, and the sun promised to continue shining. Anticipating the day’s events based on past years’ experiences, we were told that the young kids would run around and play together and the elders among the group would regale newcomers with stories that stretch back over decades. Past, present and future live side by side there and find a way to communicate through the ups and downs of nature, time, governments, and people. And industrial and technological advancements whisk us across nine time zones and back to Los Angeles in about 11 hours so we can enjoy our coffee with our friends in Santa Monica a few hours after the fair has been cleaned up on our friends’ street in Bad Godesberg. I have the best job in the world. I get to see nature as it twists itself into infinite manifestations adaptive to the climates that envelope our planet. I travel across continents and immerse myself in cultures, meeting people in conversations that dig into their psyches and their worlds. I visit a kaleidoscope of international businesses that reflect human creativity, invention and need. In other words, I live anthropology, all because of the value of the stories our company’s video cameras can capture and tell (with a little aid from us humans). It is a warm summer night this evening, and I am walking 22 blocks from Penn Station to the East Village to meet my daughter for dinner at Souen, a macrobiotic restaurant that has been around since before I became a vegetarian in 1974. The streets are so crowded that I am momentarily annoyed at being jolted out of my peaceful day. Within a few blocks the throngs thin out into gentler waves of characters that my brain can process. That is when I fall in love with the city again, each time anew. I see the soft blur effect between the people ending their business days, heads appearing stuck in issues that refuse to stay behind in their offices, and the people on their way to a fun evening – a date, a birthday dinner, a social gathering. I chuckle at a group of tourists, all standing at a corner and taking the same photo of the Empire State Building. I strain my ears to hear two young men speaking so loudly in Polish that I can make out some words from across the busy street. I shop in a cute little kitchen store with all kinds of fun gadgets and buy a new coffee grinder at the same price as the department stores advertise. I pass a street where my daughter once bought an armoire that refused to slide into the back of my CRV, but no problem – this is New York! Within minutes we found a man with a van who whisked the armoire to her apartment. Life here is animated, electric, like thousands of separate cartoon strips all interwoven into a fabric of people accustomed to and comfortable with the differences that surround them – cultural, linguistic, racial, religious, sexual, and sometimes just in terms of personality. “It’s all good,” as they say – as they all seem to say — here in New York. I arrive at Souen before my daughter, and I wait at the counter that overlooks the street. Next to me is a woman eating her dinner with a literary companion in the form of an E-Reader. The letters are larger than 12-point font, and she turns the page with a swipe of her finger, as engrossed in the novel as she is in her dinner. Feet away, on the other side of the window, real live stories walk by. They don’t distract her, though the older gentleman with unsteady legs trying to sit in the open chair between her and me causes her head to turn with a concerned expression for a few seconds. She seemed poised to help if necessary, despite the draw of the characters on her electronic screen. My daughter and I share a delicious macrobiotic, organic food dinner and interesting conversation. We say good bye as she goes to the #4 or 5 train and I begin my return 1.25 mile trek on foot to Penn Station. I could take the subway too, but that would require trading in my imaginary ticket to the greatest show on earth — the streets of New York — replete with countless moving parts that provide a never-ending source of inspiration. That’s my New York: dinners with my kids and interesting friends, tasty veggie food at affordable prices, hearing every language on the planet spoken within a city block or two, observing non-judgmental people passing non-self-conscious people who are busy doing their “thing,” and reveling in the intelligence, creativity and happiness that seems to waft out of apartment windows opened wide on beautiful summer days. My email and LinkedIn group inboxes are constantly flooded with the latest information concerning every aspect of video. While often the information falls into the common sense category, sometimes I see data that piques my interest. Two such summaries came across my screen this week, one focused on YouTube’s algorithm for ranking video and the other containing an infographic with more off-beat statistics concerning the use of video by marketers and advertisers. Several months ago the Official Youtube Content Partners and Creators blog announced that it would rank videos based on the extent to which viewers actually watch them rather than simply the number of clicks any given video receives. The blog noted that the company wants to “reward engaging videos that keep viewers watching.” This approach is consistent with the SEO focus of Google (which owns Youtube) on substantive content on websites. This information interlaces with the infographic, posted by Larry Thomas on the Latergy Social Video Channel. According to a recent study by videoexplainers published by visual.ly, videos that are over one minute in length produce more click-through rates than shorter videos, except for videos that are 15 seconds or less. Videos that fall into the category of 16 to 60 seconds in length are 41% less effective than videos that are over a minute. So putting these pieces of information together: Though it is commonplace today to lament the lack of attention span across wide swathes of the population, it seems that many folks out there are actually interested in more substantive content and are watching it in video form — and Google/Youtube is rewarding those producers. My advice: Short sound bite videos (particularly those under 15 seconds) containing clear, articulated information are impactful (153% more effective in terms of click-through rates than videos between 16-60 seconds, according to the infographic) and should be included – in multiples – as part of an online video strategy. But they should be anchored to longer, content-filled videos. Of course, “longer” is a relative word, and it does not have the same meaning as “long.” An examination last year of Youtube codes seeking the length of the top 950 viewed videos on Youtube determined that the ideal length in terms of audience engagement (other than for music videos) is 2.5 minutes. That sounds about right to me. If the content is interesting, I think it is okay to stretch the timeline a bit. If there is more to say after that, it is, in my opinion, time for another video. 4 in 10 social videos are humorous and viewers of those videos are more than three times as likely to click to a brand’s Facebook page than viewers of non-humorous videos. Celebrity videos drive 12% fewer visits to brands’ Facebook pages than non-celebrity videos. My takeaways? Comedy over celebrities, and make sure your video budgets reflect the outcomes you are seeking. How do you prepare for an on-camera interview? What will “social video” mean next year? What is the ideal length for a corporate video? What video editing system do you use? Please join the LinkedIn Corporate Video Production group to gain insight into the most current trends in video from our dedicated community of industry professionals. I spent day three of the NAB Show learning about a variety of the latest and greatest technologies, intent on finding potential time-saving and creativity-enhancing products that will benefit the clients my company Voices & Visions Productions serves. A staggering number of vendors populate the conference, often providing demonstrations. I also enjoy keeping my eyes open for creative and interesting products outside the current scope of my needs and budget. In the media storage and network data transfer departments, I was impressed by the affordable and fast G-DRIVE PRO with Thunderbolt — a two bay hot swappable drive system that can be used as a hub for multiple non-Thunderbolt hard drives. The docking station is configured as 500GB or 1TB interchangeable storage drives that can also be used as standalone external hard drives. Expect to see it on the market in May with a price point in the $750 range. 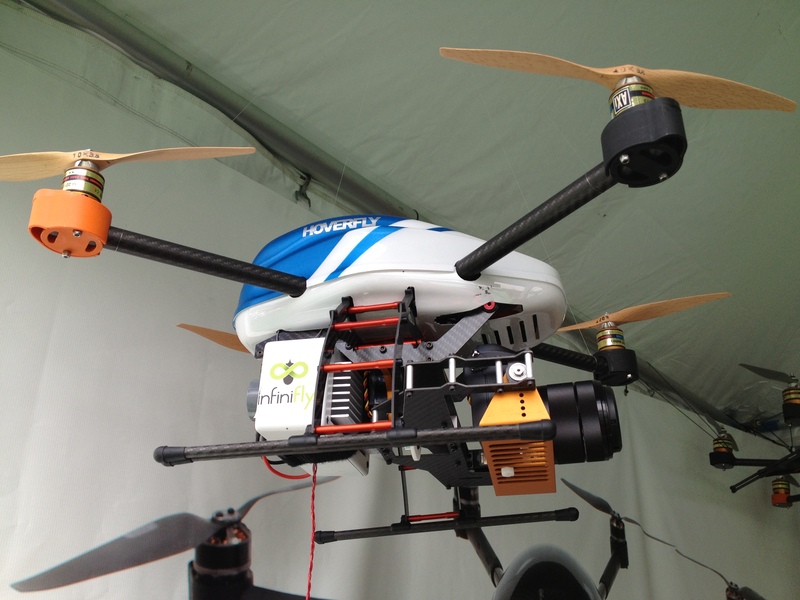 An aerial filming platform on display at the 2012 NAB Show in Las Vegas. For a change of pace I spent a little time looking at aerial recording platforms (i.e., helicopter-style remote-controlled camera-mountable flying machines) made in New Zealand. These stabilizer-enhanced flyers come in all sizes, enabling usages that range from indoor shots to aerial footage of large vistas. A vendor’s rep was more than happy to help me visualize all the work and play scenarios for which I could use this toy. 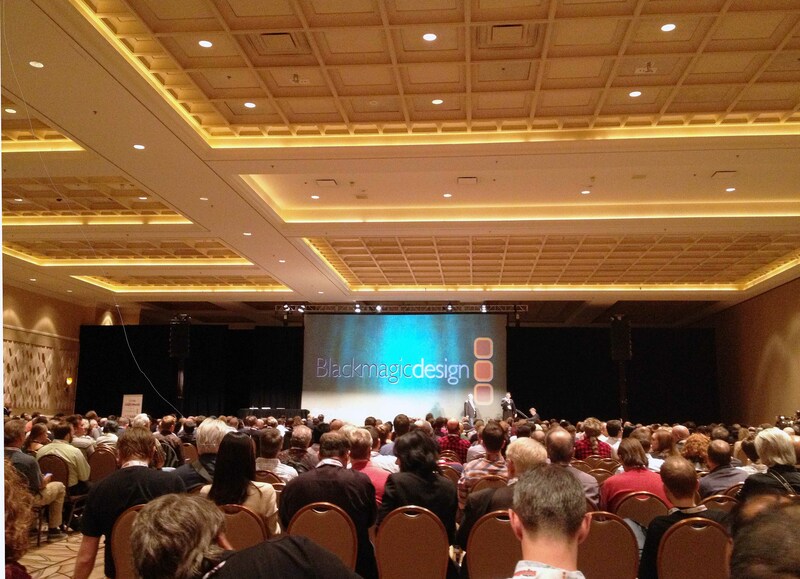 Tuesday night I attended the 12th annual Creative Pro User Group (CPUG) Las Vegas Super Meet. The CPUG is a welcome immersion in the latest developments in content creation. Formerly known as the Final Cut Pro User Group, the name was changed several years ago to better reflect the broad range of collaborative editing workflow systems its members are using. Over 1200 content creators attended last nights 12th annual Creative Pro User Group (CPUG) Las Vegas Super at the Rio Hotel, in Las Vegas. With 1200 professionals in attendance, numerous speakers discussed the newest innovations and trends in the industry, with Adobe, AVID, Black Magic/Divinci, and a host of others offering in-depth looks at new functionalities of their respective products. LA branch CPUG leaders Mike Horton and his colleagues structured the event to ensure ample opportunities for open discussions between audience and presenters. CPUG attracts a wide spectrum of top-shelf sponsors who are receptive to insights that the attendees frequently provide. The industry looks to the users’ group meet as a sounding board for its newest product lines. · The 2013 show hosted more than 1,600 exhibitors. · The show spans 900,000 square feet of exhibit space, up from 815,000 in 2012. · The Academy Award-winning Coen brothers (The Big Lebowski; O Brother, Where Art Thou? ; True Grit) are using Adobe Premiere Pro for their next feature film slated for late 2013. Their last movie, No Country for Old Men (winner of 4 Oscars), was edited on FCP 7. · The show wraps Thursday at 2pm. The annual National Association of Broadcasters (NAB) show opened its door this morning, Monday, at 9am for the first of four days of exhibits and events. The NAB is the world’s largest and most important media and entertainment event, featuring everything (and I mean everything) needed to bring “content to life.” Held at the Las Vegas Convention Center, the exhibit halls were teeming with scores of international industry professionals and providers. The popular topic of the day in the camera exhibits area of the floor focused on advances in digital television, particularly higher resolution video formats. While industry professionals have now completed the transition to HD, there is a groundswell shift toward 4K products. 4K UHD has twice the horizontal and vertical resolution of the 1080p HDTV format, with four times as many pixels overall. Vendors recognize that total integration will not happen overnight, but 4K is on its way. In this interim period, some of the major producers of video cameras are providing creative solutions for the industry, and third party manufacturers have produced some awesome gadgets that give professionals options to customize their core units. possibilities available to maximize productivity. Attendees come from 150+ countries; there are 63 delegations. Over 91,000 media and entertainment professionals are expected. 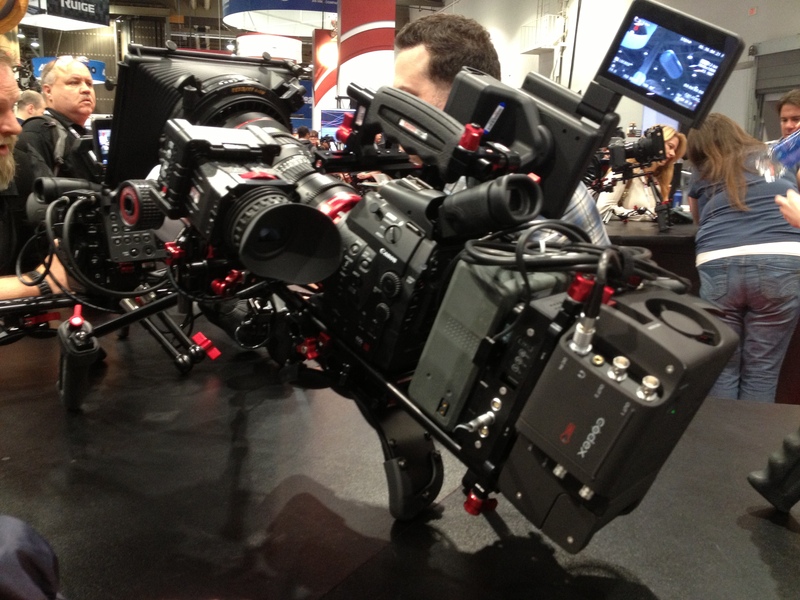 NAB Show participants represent $20.7 billion (USD) in purchasing power. More from the floor tomorrow.